Maximize predictive accuracy and throughput of industrialized cell-based assays, and minimize costs by assuring the quantity, quality, and consistency of cells needed, and the relevancy of the information generated. The number of analytic measurements that can be made on cells has grown tremendously. With technology ranging anywhere from fluorescence to impedance. MORE RELEVANT DATA – Optimal, full-time physiologic simulation of conditions provides more relevant data. BETTER PHENOTYPE INTEGRITY - Better control of cell phenotype integrity allows better distinction between different organotypic cells. Cell types that require specific culture protocols are going to be more true and consistent when each of multiple protocols can be accommodated simultaneously. MORE ROBUST HEALTHY CELLS - Produce more robust healthy cells needed to handle the rigors of relentless automated processing and analysis required during cell based assays. More data can be generated over a longer cell life cycle, and the quality of data remains higher longer. FULL TIME OPTIMIZATION - Controlling cell parameters at optimal conditions during incubation, processing and analytic procedures will allow longer more detailed multiple measurements without cell degradation. LESS CONTAMINATION - Isolating the entire process in absolutely aseptic conditions increases throughput by preventing contaminations. BETTER RESOLUTION – The reliability of cell-based assays is adversely susceptible to culture fluctuations in temperature, humidity, O2, pH, and CO2. Eliminating exposures to suboptimal conditions will increase throughput by reducing variation in cells. Smaller standard deviation means you need fewer data points to get the same answers requiring less material, less labor, less overhead and less time. 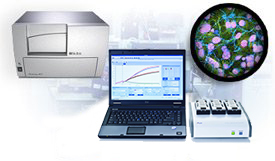 Run more cell-based assays in the same amount of time. Much is now known about the negative effects of standard incubation practices on microplated cell cultures. Conventional "People-Centric" incubation and processing equipment is not designed to deliver the consistent environmental conditions cells need. Every time cells are removed from incubators for analysis, variations in the cell's environment cause variations in cell viability, cell phenotype, cell consistency. Worse, it can skew the results of cell-based assays. The consequence of carelessness is lost or damaged lives. Full time optimization, full time protection, physiologic simulation, multi-protocol ready, reduce the variability by improving the control over environmental factors. Xvivo System® provides the only cytocentric® platform which allows you to integrate the entire chain: cell production via incubation and processing, preparation of assays, automation, imaging, and analytical equipment in fully closed isolated contaminant-free environment optimized for cells. The need for top quality consistent cells is key to assay effectiveness. Cytocentricity is at the very heart of uncompromised critical data.